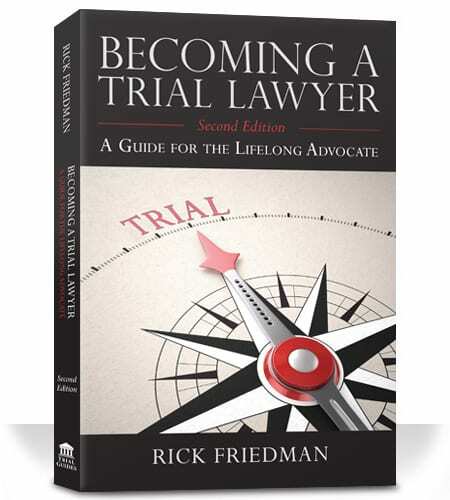 In his third book, Becoming a Trial Lawyer, Rick Friedman addresses the inner barriers that prevent many trial lawyers from reaching their full potential. Combining practical advice with inspirational insights, he guides you on the journey every trial lawyer must take, from the struggle to gain trial experience to the search for happiness in a career fraught with conflict and frustration. While the book does discuss how Rick went from being a solo lawyer with no legal experience in a small town in Alaska, to one of the most acclaimed trial lawyers today, the book is not an autobiography. It is about the steps you can take to develop your full potential as a trial lawyer. Click to Purchase.